Nucleons (protons and neutrons) are complex structures, whose primordial ingredients are three "valence quarks": for the proton and for the neutron. The electric charges of the up quark and the down quark are and , respectively, which add up to a proton charge of and a neutron charge of 0. 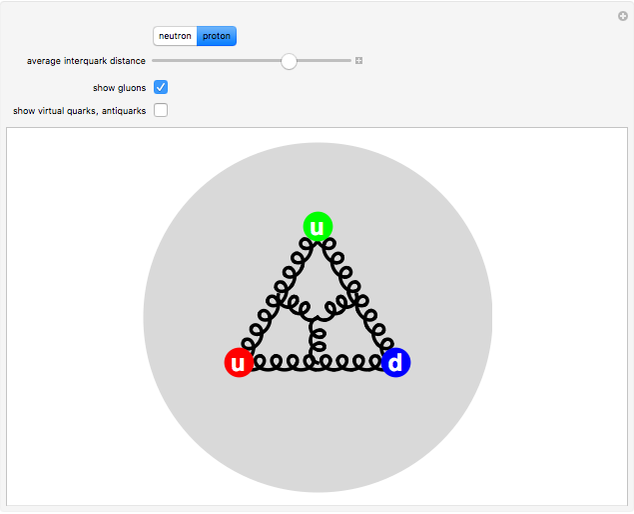 Each quark flavor exists in three possible charge states, commonly designated as red, green, and blue. The quark colors are continually exchanged by absorption and emission of gluons. This is the mechanism of the strong interaction, described by a theory known as quantum chromodynamics (QCD). Hadrons can exist only in color-neutral combinations: either three colored quarks for a baryon or a color-anticolor pair for a meson. This implies perpetual quark confinement, negating the possibility of observing free isolated quarks. High-energy scattering from nucleons confirms their composite structure. Detailed analysis of momentum transfer in scattering experiments implies that the intrinsic masses of the and quarks are approximately MeV/ and MeV/ , respectively. (Recall that the electron has a mass of MeV/ .) Thus the combined mass of three quarks can account for only about 1% of the proton or neutron mass, MeV/ and MeV/ , respectively. 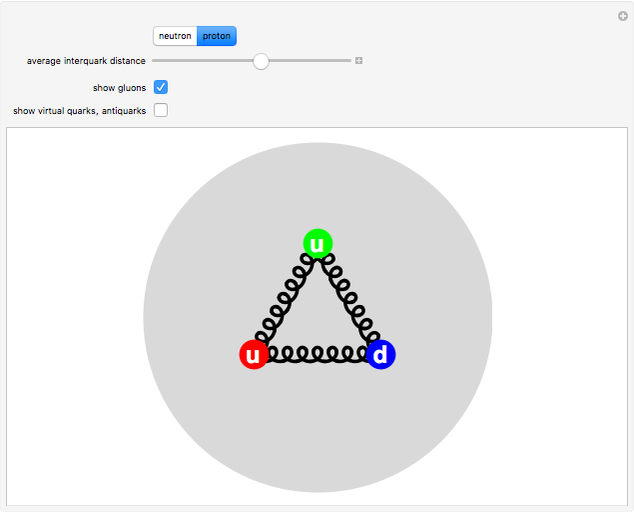 It is now understood that the preponderance of nucleon mass originates from the energy of gluons exchanged between quarks and also interacting among themselves. (Unlike photons, which carry no charge, gluons carry color charges and interact strongly with one another.) Frank Wilczek calls the relation , showing how energy can create mass, "Einstein's second law", or "mass without mass". 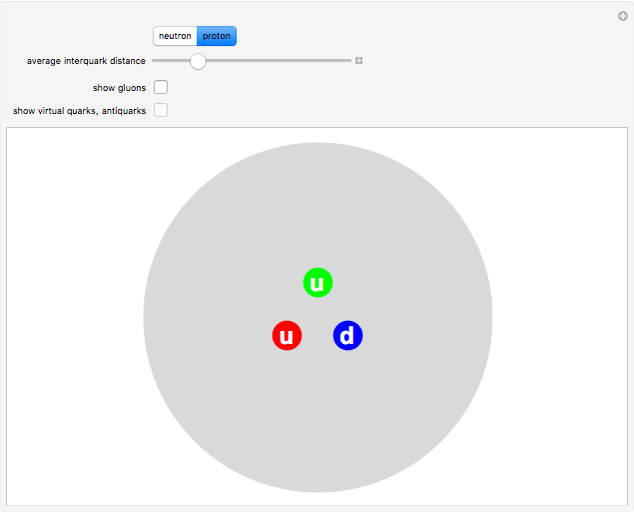 The gluon field also can produce virtual quarks and antiquarks, shown as gray and white disks. Because of the strength of the interactions in QCD, perturbation theory will not suffice (as it does in QED). The masses of the proton and neutron can be approximated using lattice gauge theory. With the most powerful supercomputers in current use, masses accurate to about 2% have been obtained. In this Demonstration, you can go through a conceptual stepwise sequence to build up the complex structure of a nucleon. A. S. Kronfeld, "Quantum Chromodynamics with Advanced Computing," Journal of Physics: Conference Series, 125, 2008 012067. F. Wilczek, The Lightness of Being: Mass, Ether, and the Unification of Forces, New York: Basic Books, 2008. S. M. Blinder "How the Proton and Neutron Got Their Masses"